Undaunted by the fact that she largely supports not only the stance of the UK Government but also Labour and the Lib Dems over forthcoming EU negotiations, Nicola Sturgeon is eager to exploit this important issue for her own characteristically divisive means. The agenda behind her rhetoric at the British-Irish summit demanding a more direct role for the Holyrood government is transparently clear. Despite Downing Street’s insistence that it will work with and listen to devolved governments, Ms Sturgeon, once her “direct input” is declined, will enthusiastically play one of her favourite cards, that of the oppressed victim. Foreign affairs are not a devolved power and nor will they be once the Scotland Bill becomes law. It is for the UK Government to renegotiate the UK’s membership of the EU and then present its case to all of us across the UK. 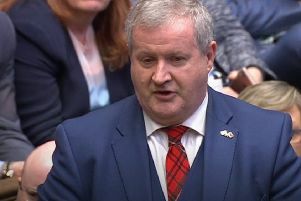 Scottish MPs should speak on behalf of their constituents in Westminster on EU matters, not the head of a parliament with no jurisdiction in this matter. Rather than interfere in issues beyond her remit, Scottish voters would be better served by Ms Sturgeon focusing on the pressing domestic problems facing the NHS and education in Scotland – both areas for which she is entirely responsible.